I cannot say enough good things about this bread. Can you believe those holes? From a 100% whole wheat bread? Awesome! And the flavor! So complex, and chewy to boot! 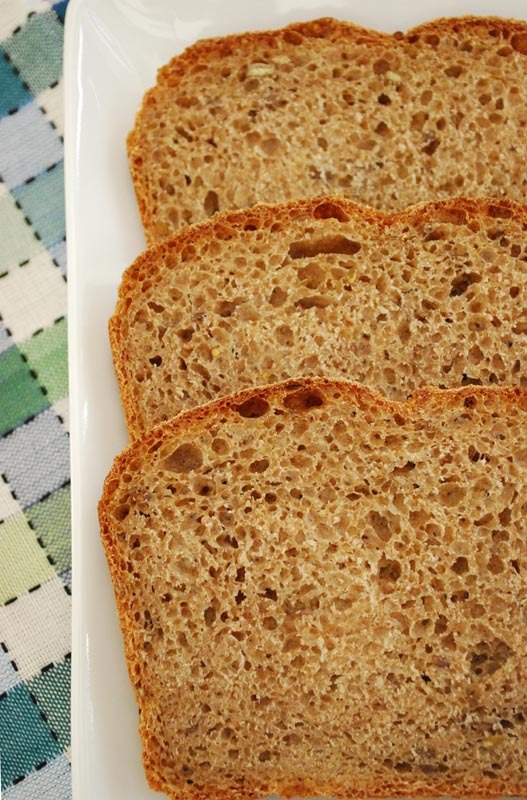 It’s just incredible – I’ve never made a whole grain bread like this one. So what’s the secret, you ask? Pre-moistening. Or soaking, or delayed fermentation, whatever you want to call it. This technique is discussed in depth in Peter Reinhart’s book, Whole Grain Breads. It sounds very technical – and what is accomplished by using these methods in fact is very technical – but in all honesty, it couldn’t be simpler to accomplish. Can you stir flour and water together? Then you can manage this with no problem. This recipe makes use of what is called a “biga”, or a thick, relatively dry starter. This isn’t very unusual in breadmaking; I’ve featured a few breads that use a biga, or something similar. Nor is the “soaking mixture” in this recipe unusual; it’s basically a long autolyse, which has also been featured in a recipe or two on this site. But what is unusual is that the flour used in the biga and the soaking mixture comprise nearly all of the flour in the dough. Technically speaking, the long fermentation of the two pre-ferments allows various acids and enzymes to begin developing, all of which contribute to improved texture and much better flavor. During this time, the gluten also begins to form, slowly enough that the bran doesn’t have an opportunity to cut it, nor does the germ get in the way of the formation. The remaining handful of flour mixed in at the end is mainly there to equalize the hydration level of the final dough, as well as to provide a vehicle for the salt, yeast, and sugar to more easily incorporate into the two starters. But enough with the tech-speak; how does it turn out? While mixing the dough, I couldn’t stop from expressing my glee at how gluteny the dough was. I’ve gotten less pretty gluten in many white breads! It was amazing! And unlike many whole grain doughs, it felt soft and smooth under my hands. It baked into a gorgeous loaf, perfect for toasting and slathering with butter and cinnamon. 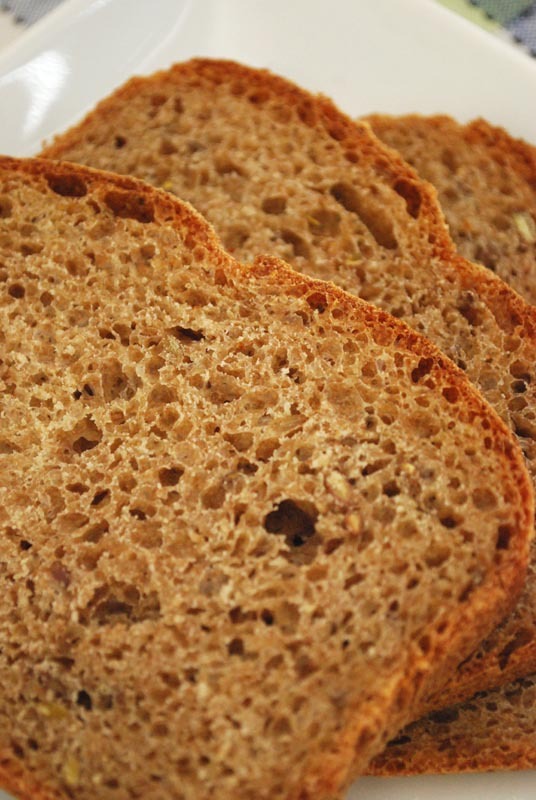 The flavor of rye deepened the taste of the whole wheat, and the flaxseed added a welcome nuttiness. The crust was hard at first, then softened a little upon standing, and would not be too hard at all for a sandwich. And did you see those holes? I know it’s no ciabatta; but I was dead pleased with myself for this one. 1. Make the biga: in a medium bowl, mix the ingredients together until a shaggy dough is formed. Turn the biga out onto a work surface, and knead for about 2 minutes, or until the dough is smooth. Transfer the biga to a bowl, cover tightly with plastic wrap, and refrigerate for at least 8 hours and up to 3 days. 2. Make the soaking mixture: stir all ingredients together until smooth. Cover tightly with plastic wrap, and let sit at room temperature for 12 to 24 hours. 3. Make the dough: remove the biga from the refrigerator and let sit, covered, at room temperature for about 2 hours before mixing the final dough. 4. Divide the biga and the soaking mixture each into 10 or 12 pieces. Combine the pieces in the bowl of a stand mixer, along with the other remaining ingredients. Using the dough hook, mix at low speed until the dough comes together, and all the ingredients are evenly incorporated, about 4 to 5 minutes. Increase the speed to medium-low, and knead for another 4 to 5 minutes, or until the dough clears the sides of the bowl and forms a cohesive ball. 5. Without removing the bowl or the dough hook from the mixer, cover the bowl loosely with plastic wrap, and let rest for 5 minutes. 6. Remove the plastic wrap, and knead at medium-low speed for 1 minute more, to develop the gluten further. 7. Transfer the dough to a lightly oiled bowl. Cover with plastic wrap, and let rise until 1 1/2 times bigger in size, about 45 to 60 minutes. 8. Lightly oil a 9 x 5 inch loaf pan. Turn the dough out onto a lightly-floured surface. Press and roll the dough into a loaf shape, deflating it a little, and pressing on the seam to seal. Tucking the ends under, transfer the dough carefully to the prepared pan. Cover with lightly oiled plastic wrap, and let sit at room temperature for 45 to 60 minutes, or until 1 1/2 times bigger in size. Preheat the oven to 425º F.
9. If the dough has risen over the edge of the pan (it should have), quickly slash the top with a sharp serrated knife. Lower the oven temperature to 350º F. Bake at 350º F for 20 minutes. Rotate the pan if necessary to avoid over-browning on one side, and bake another 20 to 30 minutes, or until baked through (an instant-read thermometer should register 195º F.
10. Remove the bread from the pan. Rub or brush the top of the loaf with the unsalted butter. Place on a rack to cool thoroughly before slicing, about 1 hour. Store leftovers at room temperature for up to 2 days; otherwise, wrap tightly and freeze. 1. I was able to find a blend of seeds specifically for sprouting in the bulk spice section of my local Whole Foods, so I used that. But if you only find flaxseed, that’s just as good too. 2. You can use whatever grain flour you like in place of the rye flour (including plain wheat, oat, or rice bran). I opted for rye because I like the depth of flavor it gives a wheat bread. 3. When shaping the dough in step 8, try to use as little flour as possible. The more you add, the tougher and denser the bread will turn out. The fairly loose dough may stick, but I say it’s better to clean your counter and hands than give up excellent texture! A bench scraper will go a long way towards helping you move and shape such a slack dough. This makes incredible bread, thanks for sharing the recipe! It seems to actually be pretty forgiving in the end, the last time I made this I barely shaped it and left the dough out, already in the pan, in a cool kitchen for the last rise and put it in the oven in the morning…and it turned out maybe not so pretty but with great flavor and a focaccia-like sponginess. Eva: Good to know the dough is so easy-going! This was definitely one of my favorites, such a great flavor. Thanks for the comment!